Have you completed the Lake Macquarie Landcare Team Leader Training? Are you interested in learning practical bush regeneration techniques and weed identification skills? In addition to monthly Team Leader Training sessions, we are now running Practical Skills for Team Leaders sessions which will focus on bush regeneration methodology, weed control techniques, site inductions and using the daily diary in the field. The next of these free sessions will be held from 9am-12pm Saturday 4 May at the Landcare Resource Office, 80 Toronto Rd, Booragul, with an excursion to a nearby reserve. Please wear covered footwear, sun-safe clothing and bring a drink bottle along on the day. Held most months, usually on the last Saturday 8:30am-12:30pm- At the Landcare Resource Centre, Cnr Toronto & Five Islands Rds Booragul. 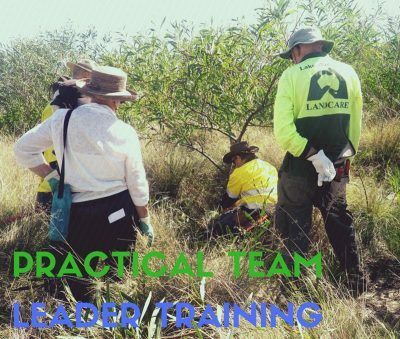 These free training sessions provide you with the skills to be a Landcare group leader. As well as learning valuable environmental and safety information, you are awarded with a certificate and free educational resources to assist with your Landcare site. Bookings essential to LRC on 4921 0392. Tea, Coffee and biscuits provided. Our Landcare groups often join in with celebrations of environmental events that occur annually throughout the year. To pre-order plants for National Tree Day, send us a resource request form or call the LRC on 4921 0392. For further information on annual events visit the Australian Government Calendar of Environmental Events. For photos from past events please access the Photo Gallery.